We were away early today. Messed up water-wise last night so no water for a cuppa. No frost on the tent though so that was good. Easy walking again today because of the towpath being a well tarmaced cycle route 55. The mile markers seemed to pass quickly, or easily, and the countdown to Preston Brook gets nearer. We will leave the canal there and head up towards the Mersey and on to Liverpool. But that will be a couple of days yet. 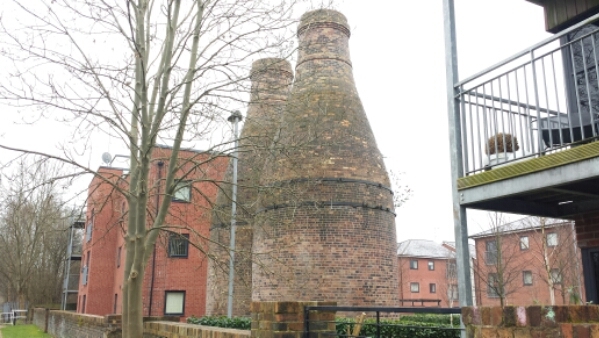 Passing through the villages now merged into Stoke on Trent we passed the remains of the pottery industry that once dominated this area. Walked up into Stoke and found ourselves outside the railway station. Directly opposite was the North Stafford Hotel. 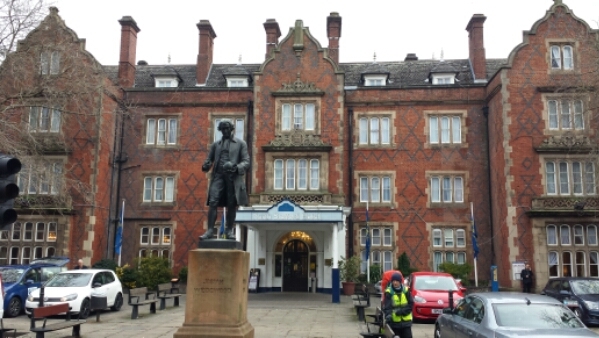 In front was a bronze statue of Josiah Wedgwood beckoning us in. So we went in and enjoyed “Tea for Two” in the lounge. Had a lovely relaxing stop, partly charged our phones and finished yesterday’s blog. While enjoying a cuppa my phone rang. It was Sarah Robertson calling from BBC Radio Stoke. As we were in their area they had somehow heard about our walk and wanted to arrange an interview. So sometime early tomorrow morning they will transmit an interview with us. Will report back tomorrow! Leaving the plush comfort of the hotel we rejoined the canal. Two “pink ladies” ran by and noticed the writing on our rucksacks. Suzanne and Jennie asked about our walk and told us about the charity runs they have done for Macmillan. They took our photo and we took one of them. 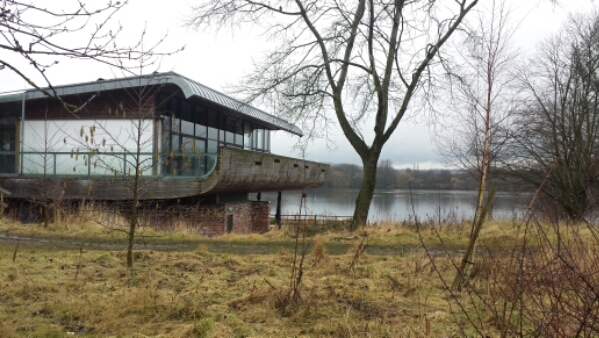 They suggested that Westport Lake Visitor Centre would be a good place to get a cuppa too. Thanks girls – great to meet you both. So here we are at the visitor centre writing up the blog. 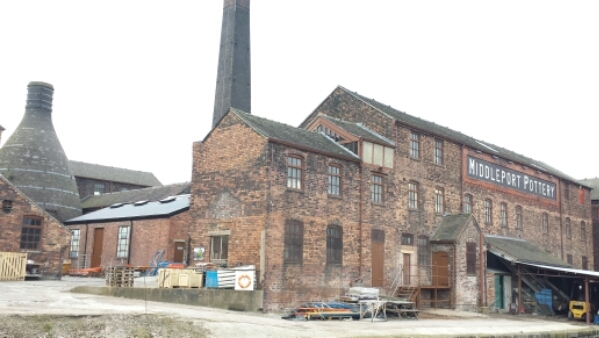 Must mention our visit to Middleport pottery and museum. It’s still producing pottery but we were shown around the old works and best of all entered their last surviving bottle kiln. A great visit and we will do the full tour when we next visit Stoke. Thanks to Ernie and Jean, and Rob. As we entered the visitor centre the clouds had already blotted out the sun. Now after tea, crumpet and coffee it has started drizzling. While we were siting enjoying our coffee some people in the cafe came over to ask about our walk – we received donations from Les Hancock from Wolstanton and Ann Gidman from Newcastle under Lyme. Thanks both. The forecast is rain so looks like a damp end to today and more to come tomorrow. We were told that a good place to wild camp is just a few miles away so that’s where we are heading. Tommorow will see us reach 500 miles so another selfie is on the cards. Not exactly sure where but will let you know tommorow. After leaving Westport Lake we walked a further few miles. Met a couple of cyclists – brothers Dan and Gaz on their way home from work at Ceramitec Printers. The company provides printing for the pottery industry. We have now camped for the night in Bathpool Park. Looks like we will be taking another selfie tomorrow to mark our 500th mile after only 0.55 miles! Hi Gaz. Great to meet you both, thanks for stopping. Ernie and Jean here from middleport pottery so lovely to speak to you today glad you enjoyed your brief walk through Stoke on Trent and it was inspiring to meet you both. Glad you found Bathpool park and hope you don’t get too wet tonight. Good luck with the rest of your walk. We really enjoyed our visit and thanks for looking after our rucksacks while we walked round. Will definitely be back for a longer visit. 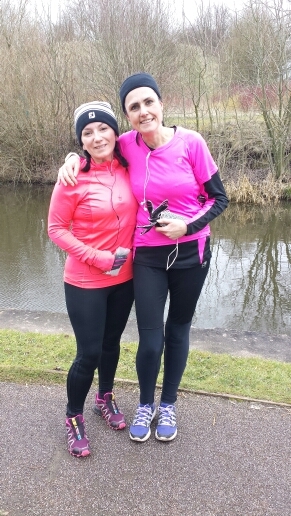 Loved meeting the 2 “pink runners”. You brightened up our day. Good luck with your next run.